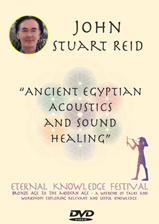 Were the ancient practice of acoustics and sound healing, known to the Egyptian priest-architects? The ancient Egyptians laid the foundations of many sciences and some of their discoveries influenced Greek and Roman technologies. In the field of acoustics we know from the Roman architect, Vetruvius, that acoustic techniques were employed in both the Roman and Greek cultures; knowledge that was almost certainly inspired by acoustical principles obtained from ancient Egypt. Almost every person who has experienced the acoustics of the Great Pyramid’s King’s Chamber has walked away with a feeling of awe, in some cases coupled with an impression that the chamber was designed to be reverberative. For a relatively small chamber the reverberation is indeed extraordinary; one can literally hear one’s own breathing (when the fluorescent lighting is turned off!) and this experience often accompanies feelings of deep reverence. This notion of design implies a prior knowledge of acoustics.